As we watch the ongoing rapid loss of Arctic sea ice, freshwater ice, permafrost, and spring snow cover, the corresponding amplified warming of the Arctic region (AAW) continues to increase (see essay on Surface Air Temperature). These disturbing changes to a key component of the Earth's climate system has spawned a blizzard of new studies that reveal influences of AAW on weather patterns within and beyond the Arctic. Media and public interest in the topic has also been keen, as the loss of Arctic sea ice is one of the most conspicuous symptoms of human-caused climate change (Notz and Stroeve, 2016) and unusual weather events often dominate headlines. A case in point: damage in the U.S.A. caused by extreme weather events in 2017 was the costliest in history at over 300 billion dollars (see https://www.climate.gov/news-features/blogs/beyond-data/2017-us-billion-dollar-weather-and-climate-disasters-historic-year). People are being affected directly by these events, and increasingly they're asking, "What's up with this? Is climate change playing a role?" Scientists can now answer a confident "yes" to that question, though the exact degree of influence is difficult to pin down. It's clear that global warming is increasing the intensity of heatwaves and droughts, as well as the frequency of heavy precipitation events, but the lines of influence are fuzzier when it comes to the effects of AAW. Progress in understanding the connections, however, has been steady. In recent years, researchers have learned that it's not just one connection, but rather several that vary with season, region, and fluctuating natural states of the climate system (e.g., ocean temperature patterns like El Niño). The general hypothesis is that when the Arctic warms faster than lower latitude regions, the north-south temperature difference is reduced. Because that temperature difference provides the main fuel for the polar jet stream (a river of strong wind at levels where jet aircraft fly), the predominantly west winds of the jet stream weaken. A slower jet stream tends to favor a more meandering north-south path and to shift the mean jet latitude southward. A wavier pattern allows warm air to penetrate farther north and cold air to plunge farther south, compared to when the jet is strong and relatively straight (Fig. 1). Larger waves also tend to linger in one location, as do the surface weather systems they create, which results in persistent weather conditions that can turn into extreme events. Fig. 1. 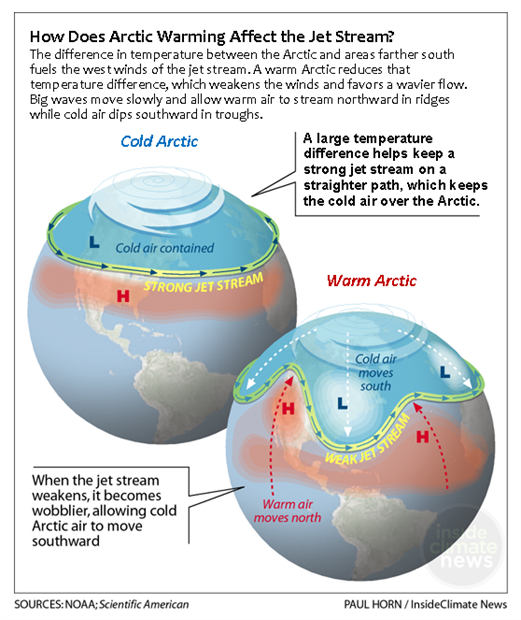 Effects of Arctic temperature changes on the jet stream and mid-latitude weather. Adapted from the original sources: NOAA, Scientific American, and InsideClimate News. In addition to AAW, we know that many changes in the climate system are happening simultaneously and are also affecting mid-latitude weather regimes. For example, most climate model simulations for the future indicate that another area of amplified warming will occur in the upper atmosphere over the tropics (though there's no sign of it yet in observations). This amplification will increase the north-south temperature difference between the tropics and mid-latitudes and oppose the influence of AAW (Peings et al., 2018; McCusker et al., 2017). The spectrum of change in the climate system, along with the inherently chaotic behavior of the atmospheric circulation, hinders efforts to assess the influence of any one factor on weather patterns (Vavrus, 2018). Despite these obstacles, some aspects of the AAW's influence on the large-scale circulation have come into sharper focus in the past few years. Some recent investigations based on global climate models have convincingly demonstrated that including atmosphere-ocean interactions (Deser et al., 2016) and a well-resolved stratosphere (Zhang et al., 2018) are necessary to capture realistic atmospheric responses to sea-ice loss and AAW. However, many details of linkage mechanisms remain elusive (Sun et al., 2018). Progress in understanding three specific examples of Arctic/mid-latitude linkages is summarized here: west-east contrasts in North American weather, sea-ice loss and winter extremes over Eurasia, and stagnant conditions over continents during summer. For a more complete recent review, see Vavrus (2018). North American warm/dry west–cold/wet east. Since late 2013, the predominant weather regime over North America has featured a strong and persistent jet-stream ridge aligned north/south in the eastern Pacific, which diverts storms away from California and sends abnormally warm winds into Alaska (Fig. 1). This so-called "ridiculously resilient ridge" (Swain et al., 2017) is perpetuating drought, heatwaves, and extensive wildfires across much of western North America. A strong jet-stream ridge is often accompanied by a downstream (eastward) trough, which allows cold Arctic air to plunge southward, bringing persistent icy conditions to the southeastern U.S.A. (Cohen et al., 2018) and can spawn a parade of destructive nor'easters along the eastern seaboard, as in winters of 2013-14 and 2017-18. How might Arctic warming help promote this ridge/trough pattern? Recent studies reveal that a western ridge is more likely when ocean temperatures along the west coast of North America are warmer than normal (Swain et al., 2017). The strength of this ridge may then be bolstered by low sea-ice extent north of Alaska, where ocean temperatures are abnormally warm owing to extra solar heat absorbed during summer. This heat is then released back to the atmosphere when cold autumn air masses arrive, contributing to AAW in the region and augmenting the ridge's bulge in upper levels of the atmosphere. Strong ridges usually trigger a southward jet-stream dip to their east. Consequently, this persistent pattern is favored when a natural fluctuation in Pacific Ocean temperature anomalies combines with regional AAW in the Pacific sector of the Arctic (Francis et al., 2017), perhaps boosted by a tropical connection (Cvijanovic et al., 2017). Cold Eurasian winters linked to sea-ice loss in the Barents and Kara seas. Similar to the North American situation, a strong and persistent ridge/trough pattern has occurred with increasing frequency in Eurasia in recent decades (Fig. 2). New studies have strengthened the evidence for a role played by sea-ice loss in the Barents and Kara seas (e.g., Ye et al., 2018; Zhang et al., 2018; Kretschmer et al., 2016; Yao et al., 2017), though other studies attribute it to random chance (e.g., McCusker et al., 2016). The story again begins with a climatological ridge (i.e., a long-term average pattern) that tends to form near the Ural Mountains, which acts as an obstacle to westerly jet-stream winds in western Russia. North of this ridge are the Barents and Kara seas in the Arctic Ocean, regions of rapid sea-ice loss and warming in recent years. As with the North American case, the existing ridge is intensified by the extra heat absorbed in and subsequently released from the ice-loss region. A stronger ridge creates a stronger surface high pressure system over central-eastern Asia and transports cold Arctic air over the continent, which depresses the jet stream southward into a deeper trough over Asia. Arctic air is then free to plunge southward, favoring persistent cold spells in eastern Asia and contributing to observed cooling trends in the region. Under the right conditions, this ridge/trough pattern can become so intense that the resulting wave energy in the jet stream is transferred upward into the stratosphere, disrupting the normally circular flow of the stratospheric polar vortex, causing it to bulge southward or perhaps even split into two circulation centers. When this occurs, large jet-stream waves often persist into late winter and even early spring, resulting in extended periods of unusual and sluggish weather patterns around the Northern Hemisphere (Kretschmer et al., 2018). This mechanism clearly occurred in winter 2017-18, perpetuating large ridges and troughs around the Northern Hemisphere well into spring that were responsible for severe cold in East Asia, heatwaves at the North Pole, the "Beast from the East" in Europe, a swarm of nor'easters in New England, and a variety of other disruptive weather abnormalities. Fig. 2. Sea-ice loss in the Barents/Kara seas favors intensification of the climatological ridge located in the region, which strengthens the Siberian High pressure cell and transports cold Arctic air into east Asia. Wave energy from a more meandering jet stream disrupts the stratospheric jet stream and reinforces the pattern into late winter (Zhang et al., 2018). From https://usclivar.org/research-highlights/loss-arctic-sea-ice-impacts-cold-extreme-events. Persistent summer weather patterns over continents. The Arctic meltdown may also be contributing to summer heatwaves, drought, wildfires, and flooding over Northern Hemisphere continents. New studies suggest that the disappearing spring snow cover focuses Arctic warming during late spring and early summer over the far-northern land areas (Fig. 3 and Francis and Vavrus, 2012). This loss of snow during the season of most intense sunshine causes the soil to dry out and warm earlier, effectively giving summer heating a "jump start" (York et al., 2018). The zonal belt of warming that rings high-latitude continents also can create a double peak in the north-south temperature trend, which favors the formation of a split jet stream. Weather systems can become trapped between the jet branches, causing prolonged hot spells, drought, or rainy periods that can lead to extreme events (Mann et al., 2017). Recent deadly heatwaves (e.g., Europe in 2003 and 2018, Russia in 2010, Japan in 2018, and the U.S.A. in 2011 and 2018) and floods (e.g., Pakistan 2010 and Europe 2013) are consistent with this hypothesis. The general relationship between land-based AAW and summer extremes is also supported by model projections of the future analyzed by Vavrus et al. (2017). They found a belt of abnormally warm air temperatures overlying the snow-loss areas in North America, which created weakened upper-level westerly winds south of the belt and stronger winds to the north. The band of weak winds is associated with amplified jet-stream waviness measured as "sinuosity," which favors persistent drought and heat spells during summer in mid-latitude continental areas. Fig. 3. 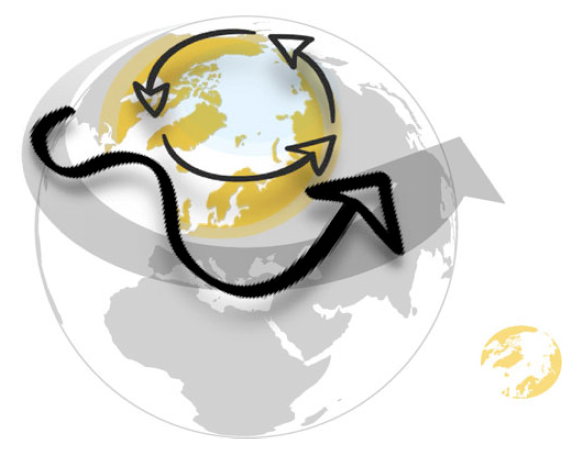 Amplified Arctic warming in late spring and summer (yellow shading) tends to occur mainly over high-latitude continents. Through a mechanism called quasi-resonance, AAW favors the amplification of quasi-stationary jet-stream waves, leading to more persistent weather conditions and extreme events such as heatwaves, drought, floods in continental areas. (from Coumou et al., 2018). The connections between climate change and extreme weather are a topic of intense scientific interest and of profound societal impact. Some of these effects are clear—more severe heatwaves, more frequent heavy precipitation events, and more intense droughts—but the understanding of other less direct influences is still partly to mostly cloudy. The role of a rapidly warming and melting Arctic is one of these factors that challenges present computer modeling capabilities and understanding of atmospheric dynamics. These limitations are now coming into better focus as changes in the real world either confirm or oppose expectations based on computer simulations, offering avenues to resolve disputes in our understanding of Arctic/mid-latitude linkages. Exactly how the northern meltdown will "play ball" with other changes and natural fluctuations in the system presents many questions that will keep scientists busy for years to come, but it's becoming ice-crystal-clear that change in the far north will increasingly affect us all. Kretschmer, M., D. Coumou, L. Agel, M. Barlow, E. Tziperman, and J. Cohen, 2018: More persistent weak stratospheric polar vortex states linked to cold extremes. Bull. Am. Meteorol. Soc., 99, 49-60, doi: 10.1175/BAMS-D-16-0259.1. Yao, Y., D. Luo, A. Dai, and I. Simmonds, 2017: Increased quasi stationarity and persistence of winter Ural blocking and Eurasian extreme cold events in response to Arctic warming. Part I: Insights from observational analyses. J. Clim., 30, 4317-4333, doi: 10.1175/JCLI-D-16-0261.1. York, A., U. Bhatt, R. Thoman, and R. Ziel, 2018: Wildland fire in boreal and arctic North America [in "State of the Climate in 2017"]. Bull. Am. Meteorol. Soc., 99(8), S167-S169, doi: 10.1175/2018BAMSStateoftheClimate.1.